City and State Laws require that ALL Dogs be licensed. 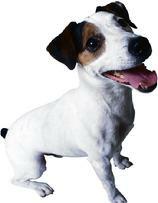 Dog Licenses are valid for ONE YEAR in Estell Manor and that is a calendar year. All licenses expire at the end of December and must be renewed every January. Rabies vaccinations MUST be good through at least the first ten months of the licensing year (October 31) in order to obtain a license. Please have your updated rabies and spayed/neutered certificate with you when you apply for the license. If applying by mail, please send these items along with your form; they will be returned to you. Click on the picture to the right for the licensing form. License forms can be mailed to City Hall - please include a self-addressed stamped envelope - your Dog's tag and license will be mailed back to you.